Meg Whitman, HP's latest CEO, added: "I think we need to be in the tablet business, and we're certainly going to be there with Windows 8. We're going to make another run at this business, and we're going to make a decision about the long-term future of webOS within HP over the next couple of months." She continued: "Many people have said to me, well, isn't the webOS decision just completely tied to PSG? The answer to that is, actually, no. WebOS obviously has use in the PSG business but also in other businesses that we have. We have to make a more holistic decision around webOS which is, you know, coming to a town near you soon I hope." She clarified that she was talking about the webOS software and not the tablet. This could tempt both subject and his biographer to produce a statuesque book, a North Korean monument to Dear Leader’s achievements. But instead of The Life and Miracles of Saint Steve, we get the gift of truth. We are forced to stare at the reality, or realities of the actual man. Thinking of his children, for whom Steve said the book was, so they got to better know him, this book is a great present. Judging oneself only by comparison to the better side of a parent is a terrible burden. Walt’s book gives them an independent look into the incredibly luminous Steve as well as into his sometimes repulsive dark side. Steve’s must have hoped to free them from his legend. Hacking Siri doesn’t require breaking Apple’s rules or diving deep into its source code. Apple designed Siri to be able to send SMS messages, and a lot of apps can understand those texts and act on them. (For instance, telling Siri to “Text Bank of America saying BAL” will send a message to one of the bank’s servers, which responds with your account balance.) The app Remember the Milk, a mobile to-do list, goes further: If you set its calendar as the default calendar in your iPhone settings, Siri commands such as “Remind me to pay the phone bill” will create new to-do items directly in Remember the Milk. The demise of Google Reader's share features is affecting everyone from RSS-junkies to Iranian freedom fighters, and many of them are very displeased. Google Reader itself is very much alive and well, and in fact, the RSS reader will soon sport a slick-looking redesign. However, at some point this week, the ability to follow, friend and share links within Reader will cease to exist, as Google pushes people to use Google+ for those kinds of things. Along with it, the myriad communities that depended on Reader for years for everything from meeting new people to organizing protests will just have to figure something else out. It turns out Google wasn't so bad at social networks, after all. Extending input with touch-first capabilities can make life easier, enabling brand-new experiences and scenarios that have become a consumer expectation. Few companies have the pedigree to fulfill this new demand, but Samsung Electronics had this foresight, leveraging its display expertise across many of its consumer product categories, to lead this new era in computing. Touch computing is now fully integrated into a variety of Samsung computing products, including PCs, slates, mobile phones and Microsoft Surface devices. Using Microsoft platform assets, Samsung expands personal computing capabilities with a touch of the finger. In a report released yesterday, analyst David Johnson recommended that IT departments should formally support Macs as well because the best employees prefer them and are bringing them to work anyway. As Fortune first reported yesterday, Johnson called Mac users the "heavy hitters" and "heroes" in organizations, and said that they hate Windows PCs because they slow them down and look cheap. "Stand in the way," he warns IT departments, "and you will get run over." The new version of Google TV is based on the Honeycomb version of Android, and can run some existing programs as well as a number of new apps specifically designed to work with the product. However, most Android apps won’t work, as they require features such as telephony or a touchscreen. Queiroz said that of the hundreds of thousands of Android apps, there should be around 1,800 apps that will work with Google TV initially, and even most of those won’t be optimized for the TV. Google has been working with about 50 developers on the first TV-optimized apps, he said. And perhaps as early as next week or soon after, Google will also weigh in with its version of the genre — code-named Propeller — which also might be the product’s name. Another moniker under strong consideration: Currents. Perhaps doubling down on Windows. Meanwhile, unhappy times for Motorola’s tablet business. We asked Stephen Elop, Nokia’s chief executive, whether he had any plans for a tablet and his answer sounded like a “yes”. We are not commenting on specific plans for tablets. But I will point out that one of the things that we are excited about in terms of support for the Windows Phone are the announcements made around Windows 8 for tablets and personal computers. When you see the user experience from the Nokia Lumia environment appearing on hundreds of millions of tablets and PCs in the future, you can see that there is a clear synergy between all those environments. So that presents an interesting opportunity for Nokia. Samsung shipped 27.8 million smartphones in the last quarter, taking 23.8 percent of the market, Milton Keynes, U.K.- based Strategy Analytics said in an e-mailed statement today. Apple’s 17.1 million shipments, comprising 14.6 percent of the market, pushed the Cupertino, California-based company to second place. Nokia Oyj maintained its third position, it said. Apple, which released its iPhone 4S this month, held the top spot for only one quarter after dislodging Espoo, Finland- based Nokia earlier this year. Samsung, based in Suwon, South Korea, has turned to Google Inc.’s Android software to boost sales of its Galaxy smartphones and tablet computers. And one of these features launched today on Google+ seems a throwback to one now-defunct feature of Google Wave, called “Playback”. Or at least one might claim this as its genesis, with the feature having its roots in-house, as opposed to some sort of reaction to Facebook’s much bally-hooed timeline that launched this September. Yes, today, Google launched its new Google+ Ripples, which will let users “re-live” the conversations, comments, and sharing that’s taken place over the history of their use of Google+. Check out Google’s blog post here. In other words, Ripples is a “visualization tool for public shares and comments”, which users can access by simply selecting the “View Ripples” option in the drop down window to the right of the public post. But that hobby could soon reap astounding financial returns. A recent report issued by Barclays predicted that if Apple made a television set, excluding content deals, Apple could generate an additional $19 billion in revenue a year. This number would not be a stretch either; Barclays said in the report that Apple would only need to capture 5 percent of television buyers to reach this goal. It is coming though. It’s not a matter of if, it’s a matter of when. IT industry giant IBM plans to roll out NoSQL technology inside of its flagship DB2 database management system early next year, according to Curt Cotner, the company's vice president and chief technology officer for database servers. The move comes in response to growing customer demand for NoSQL technology, said Cotner, who spoke yesterday during a keynote address at IBM's Information On Demand 2011 conference here. Dropbox's position is both enviable and daunting. The company has seen its user base rocket from 25 million to 45 million since April, and it recently secured $257 million in funding from several venture capital funds, on a $4 billion valuation. At the same time, Dropbox is likely to face increasing competition from some even more popular, and well-funded, companies. Having declined Steve Jobs's offer to acquire the company in late 2009, CEO Drew Houston admits to experiencing a sinking feeling when Apple announced its iCloud service, which remotely backs up images, music, documents, and other data and syncs that content between different Apple devices. That service closely resembles Dropbox's. Google spent more than $500 million to buy another 27 companies during the third quarter, ensuring this year will be busiest shopping spree in the Internet search leader's history. The number emerged Wednesday in a quarterly report that included another previously undisclosed piece of information: Google Inc. paid $151 million in cash for the Zagat Survey, a renowned restaurant review publisher that Google bought to counter the popularity of Yelp's business rating service. At a glance, Nextdoor sounds like an awesome idea as it's geared towards providing a public service. The site allows people within a certain geographical area to set up private social networking sites that enable you to connect with people that live nearby, set up events and post status updates that your neighbors can comment on. There are also a number of tools that make hyperlocal chores like selling your mountain bike or finding a good lawn guy easier. Google's photographic tour of everywhere on always seemed a little bit limited by the term "Street View," but with photos of business interiors now appearing on Google Maps, it's breaking free of that constraint. As part of its new local efforts, Google Places reps are running around 37 global cities--in the U.S., Australia, New Zealand, Japan, France and the U.K., to be specific--to photograph the interiors of a few lucky local businesses. “Other,” the revenue category in Amazon’s reports that encompasses Amazon Web Services, is growing like mad — 70 percent over last year, in fact. This matters because it likely means AWS is outpacing its projected growth and is rapidly approaching a $1 billion run rate. Whatever the actual market size though, one has to assume AWS will be responsible for the lion’s share. Rackspace topped $100 million in cloud revenue in 2010, and has done just just over $80 million over the first two quarters of 2011. When Terremark announced its fiscal third quarter earnings in February before the Verizon acquisition closed, it claimed an annual cloud computing run rate of $37.5 million. Apple today filed its Form 10-K with the SEC that discloses information to stockholders and the commission. In an amongst the normal legal statements there were a few interesting facts. 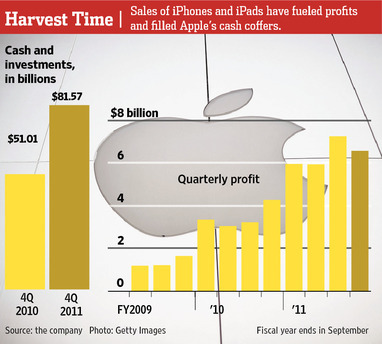 Among those were that Apple currently has $81,570,000,000 in cash, marketable securities and cash equivalents. Apple now has 60,400 full-time employees and another 2,900 temps. This is an insane jump over the 46,000 employees that it reported in 2010, a 39% increase. This is the second year in a row that Apple has jumped over 30% in employees. If more American companies started to do what Amazon does — ignore short-term pressures, sacrifice near-term profits, and invest for the long-term — the American economy would start to heal itself quickly. America would create more innovation, more jobs, and more long-term wealth. And, just as important, more Americans would be able to go back to being proud of our corporations and innovators and entrepreneurs... instead of camping in parks and protesting them. Windows Phone 7.5 is gorgeous, classy, satisfying, fast and coherent. The design is intelligent, clean and uncluttered. Never in a million years would you guess that it came from the same company that cooked up the bloated spaghetti that is Windows and Office. Nevertheless, there is a subtle optimism lurking in all of Kahneman’s work: it is the hope that self-awareness is a form of salvation, that if we know about our mental mistakes, we can avoid them. 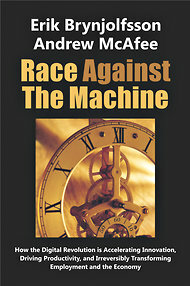 One day, we will learn to equally weigh losses and gains; science can help us escape from the cycle of human error. In other words, Amazon underestimated demand for the Fire and is ramping up accordingly. Could that be part of the reason behind today’s earnings miss? Certainly possible. Recall that according to some reports, Amazon is likely losing about $50 per Fire. Despite the American Academy of Pediatricians’ longstanding recommendations to the contrary, children under 8 are spending more time than ever in front of screens, according to a study scheduled for release Tuesday. 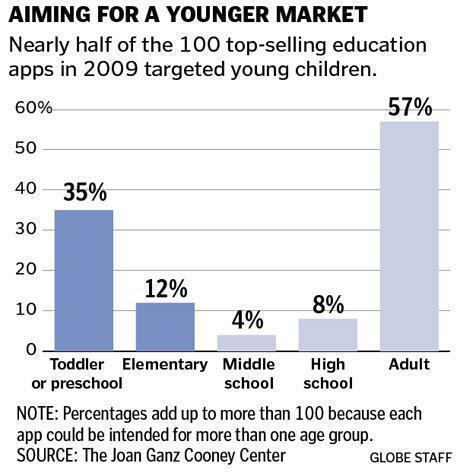 The report also documents for the first time an emerging “app gap” in which affluent children are likely to use mobile educational games while those in low-income families are the most likely to have televisions in their bedrooms. It used to be that you would look at mobile, your choice of cell phone and your choice of computing equipment as two separate, distinctive, unrelated decisions. Now they are very much becoming one and the same decision. If you look at the AT&T and Verizon solutions that are offered by Motorola, where they're also coming out with it at Apple -- dockable smartphones that create the intelligence to drive 12 to 14 inch displays on host mechanisms. They look like PCs but they're really being driven by a dockable smartphone. Those experiences are I think very threatening because they're not tablet experiences where you're playing with a scaled down web version of your applications, but you're playing with real applications and you have the ability to bring in data in all kinds of formats, whether it be display content from Microsoft applications or from Open Office. I think there's a transition now to this other strategy that's designed to preserve or create a "what you can't accomplish in the marketplace, you need to attempt to accomplish through the utilization of patents to be able to slow or stall the movement of Android to its inevitable position." It's an interesting dynamic. For Microsoft, which has had a hard time gaining traction in the smartphone market, Nokia's worldwide reach is a chance to clamber out from behind the shadows of Android, Apple and Research In Motion. "This is what could make the difference from Windows Phone becoming an also-ran or being a solid No. 3 and making its way to No. 2 in coming years," said Rob Sanfilippo, a research vice president with the independent analysis firm Directions on Microsoft. Until now, the company’s TV efforts have been limited to Apple TV, a small $99 gadget that plugs in to a television and gives users access to content from iTunes, Netflix Inc. (NFLX)’s streaming service and YouTube. Jobs had called it Apple’s “hobby,” rather than something designed to be a serious moneymaker. That may be changing. Apple has a prototype TV in the works and may introduce a product for sale by late next year or 2013, according to Gene Munster, an analyst with Piper Jaffray Cos. He based that timing on meetings with contacts close to Apple’s suppliers in Asia, industry contacts and Apple’s patent portfolio. Munster said Apple also is investing in manufacturing facilities and securing supplies of LCD screens. Fadell explained his concept: Untold tons of carbon were being pumped into the air, with people losing billions of dollars in energy costs, all because there was no easy, automatic way to control the temperature. But what if you could apply all the skills and brilliance of Silicon Valley to produce a thermostat that was smart, thrifty and so delightful that saving energy was as much fun as shuffling an iTunes playlist? You could revolutionize an important but neglected tech backwater—and significantly improve the environment. Within 15 minutes, Dani got it. As did the others Fadell would talk to over the next few months. These included a dream team of Silicon Valley engineers, designers, and computer scientists who became the first employees of Nest Labs, the company Fadell founded. Ellison was happy for his friend, but pointed out that something was missing. He said to Jobs, "If we don't buy the company, then how can we make money?" At this point Jobs got real close to Ellison and said, "Larry, this is why it's really important that I'm your friend. You don't need any more money." A new social reading app called Subtext today launches on the iPad with a selection of books laden with annotations from authors and researchers. What you’ll find on Subtext is a lot like the special features you’d find on a DVD, but for ebooks. And, you can create your own annotations. RightNow is a software as a service company that focuses on customer service via call centers and self-service options via the Web and social networks. That customer service focus is aimed at the heart of Salesforce.com. At Oracle OpenWorld, the company outlined plans to get into cloud computing, big data and other efforts such as NoSQL databases. Oracle said its NoSQL database was generally available today. That’s the title of my piece that just went up on Daily Beast, and it’s what I kept thinking as I pored through the Isaacson biography, which landed on my iPad last night. Much of the stuff in the book is not new, but much of the stuff that is new is kind of disappointing to people who want to view Steve Jobs as a kind of messiah figure. As the politicians use the Solyndra debacle as a political football, it's not helping the country. We need to find ways for these companies to get financed. One wasn't well conceived, and it's the nature of these things that some of them will fail. But maybe we shouldn't have ever had the expectation that we couldn't lose our money. Maybe the government should ask for some equity as well. They could loan the money and get some stock. And with the ones that succeed, the stock will pay off the ones that don't. That's kind of what happened with the auto bailout, right? They got a bunch of stock in GM, made a lot of money off of it. I should say "we" made a lot of money. Google Inc. is building a music-download store that would work closely with its Google+ social network and could launch it within the next two weeks, according to people familiar with the matter. Users of Google Music, as the service is tentatively named, could recommend songs in an online library to Google+ contacts, who in turn would be allowed to listen to those songs once for free. The songs would then be available for sale as MP3 downloads, probably for around the usual 99 cents each. Apple does not care about market share and never has. It cares about absolute volumes and profit margins. And this has been a phenomenally successful business model that Apple should not and will not change. The history of the tech industry is littered with the corpses of PC makers that died chasing market share. Anyone remember Packard-Bell and AST? Dell and Hewlett-Packard nearly destroyed themselves chasing share at the expense of profit and Acer seems to be pulling back from the same fruitless race. In any case, it’s a lot. Some have concluded that Microsoft makes more money from Android than from its own Windows Phones, and HTC reportedly pays Microsoft $5 for each Android phone it sells. Google, meanwhile, distributes Android (at least the smartphone version) as open source software. Microsoft collects license fees on 50% of Android devices, tells Google to "wake up"
When Stephen Elop, the chief executive of Nokia, introduces the company’s first phones bearing Microsoft Windows Phone software Wednesday, he will probably be met with equal parts good will and skepticism. Apple’s new pricing strategy is a big change from the 1990s, when consumers regarded Apple as a producer of overpriced tech baubles, unable to compete effectively with its Macintosh family of computers against the far cheaper Windows PCs. But more recently, it began using its growing manufacturing scale and logistics prowess to deliver Apple products at far more aggressive prices, which in turn gave it more power to influence pricing industrywide. The Silk browser was only one of many revelations at Amazon's Kindle event last month, but it was a doozy. Expected to ship initially only on the Kindle Fire in November, Silk promises to learn how you browse and to predict where you're going to surf to next. That kind of stickiness with your personal data left many security experts and some lawmakers uncomfortable. But the Electronic Frontier Foundation now says it believes Amazon will provide users with the tools to disentangle themselves. Apple Inc. co-founder Steve Jobs said he was “willing to go thermonuclear war” on Google Inc.’s Android software, saying that its features amounted to “grand theft,” the Associated Press reported. Jobs, then Apple’s CEO, said he would “spend every penny of Apple’s $40 billion in the bank, to right this wrong,” according to the AP’s account of his biography, “Steve Jobs,” by Walter Isaacson. Jobs died on Oct. 5. Facebook wants to help you find a job. The social network announced on Thursday that it has teamed up with the U.S. Department of Labor and three employment-related agencies in an attempt to decrease the country’s 9.1% unemployment rate using social media — a project that may eventually include a Facebook jobs posting system. The new partnership brings formal job hunting content to Facebook — which some recruiters already prefer over LinkedIn — for the first time. This week, Apple’s chief executive, Timothy D. Cook, said he thought that the iPad was cannibalizing some sales of Macs, but that a “materially larger” number of iPad buyers were choosing the tablet device over a Windows PC. Apple sold 11.1 million iPads in its last quarter. “With cannibalization like this, I hope it continues,” Mr. Cook said. Microsoft intends to tackle the threat from the iPad with a new version of Windows, known currently as Windows 8, that has been redesigned for the touch screens of tablet devices, but that product is not expected to appear for about a year. Meanwhile, RIM's own decline is something like a slow-moving car wreck. It needed to pull off a Hail Mary at its conference; it doesn't appear to have done so. Google will roll out major improvements in the next three months to Google+, its new social networking service, as it seeks to close the gap with Facebook, the market leader. Early enhancements will include the incorporation of Google Docs, the word-processing application, which will make collaborating on documents easier “within days”, said Vic Gundotra, senior vice president of engineering, on Wednesday. Online retailer Amazon.com Inc. said Wednesday that it has expanded its licensing agreement with PBS to let members of its Amazon Prime premium shipping program watch current and older PBS programs. Amazon said this will bring the total number of instant videos available to Prime members - who pay $79 a year for discounted shipping costs - to 12,000. Still, 6 million tablets should at least be encouraging, and there are more Android tablets on the horizon that could cause a splash in the market. Google probably isn’t thrilled about possible Amazon success, given what a big competitor the online retailer has become, but Amazon’s upcoming Kindle Fire might have the potential to upgrade the tablet market numbers a bit. The Android-running Fire has Amazon’s Kindle brand to lean on, which gives it some recognition and reliability, and it’s a smaller tablet that doesn’t try to be the iPad, which is also a good way to distinguish a product in a market full of imitators. Plus, there’s the Kindle Fire’s price point of $199 which will undoubtedly entice quite a few buyers who’d rather not play in Apple’s walled garden. Battelle asked about the highly critical memo from a Google engineer that was mistakenly made public. Gundotra's talking point on this: "Larry and Sergey have fostered a culture that allows open debate. The outside world got a peek into what it's like to work at Google. That's why we didn't fire him." Brin was less diplomatic about the memo. "I stopped reading it after the first 1,000 pages or so," he said. "If you want to get a point across, limit it to a paragraph or so." Anecdotal evidence bears out this fast shift. At a conference I attended last week for big-company CIOs, more than half had iPhones and about half had BlackBerrys. There were also a couple Android smartphones in use. (Some CIOs had multiple devices, thus the totals coming to more than 100 percent.) All but one had an iPad with them. I've been attending this twice-yearly conference for seven years, and in the last 18 months the shift away from the BlackBerry has been dramatic, going from 100 percent to about 50 percent. And most still using BlackBerrys expected to drop their RIM devices in the next two years. For years Netflix had carefully tested its products in focus groups assembled in the Lord of the Rings conference room in Building A at its Los Gatos (Calif.) headquarters campus or at rented space around the country. Focus groups have been asked about everything from the red color of DVD envelopes to the quality of video streams. This time Hastings skipped the focus group step, missing an opportunity to gauge customers’ potential reactions to separate websites and billing, according to the former employee. (Netflix spokesman Steve Swasey declined comment.) Instead, Hastings and his team relied on data showing that 75 percent of new signups before the price hike preferred streaming. No indication if this is related to More Facebook Friends, More Gray Matter in Brain? A teenager's IQ can rise or fall as many as 20 points in just a few years, a brain-scanning team found in a study published Wednesday that suggests a young person's intelligence measure isn't as fixed as once thought. The researchers also found that shifts in IQ scores corresponded to small physical changes in brain areas related to intellectual skills, though they weren't able to show a clear cause and effect. But investors are daunted by the challenge of revving up returns for Yahoo's core U.S. business of selling online display advertising, which has lost market share to nimbler rivals. Since Yahoo rebuffed a $44.6 billion takeover offer from Microsoft in 2008, its shares have lost nearly 44% in value. Microsoft has been less willing to make a solo run for Yahoo ever since the failed bid, people familiar with the matter said, but it wants to maintain influence over Yahoo's future. Its participation in the discussions is mainly driven by its interest in protecting and enhancing an Internet search-advertising partnership it struck up with Yahoo after its bid, they added. Under the proposal being discussed, the buyers would spin off Yahoo's Asian assets after a takeover, people familiar with the matter said. Such a valuation, which is being weighed as the company prepares for an investor road show next week to pitch its initial public offering, would be a steep comedown from earlier expectations that an I.P.O. of the Internet darling could value the company as much as $25 billion to $30 billion. But shaky stock markets in recent months have prompted the company’s bankers to revise their calculations. Enthusiasm for Groupon has also been tempered amid sharp questions over its business model and accounting. The bottom line: The recent Facebook changes really do make things both better (Timeline, Friend Lists, Subscriptions) and worse (Top Stories, Ticker). If you’ve been participating in the online gripefest, well, you have a point. On the other hand, if you hate the new design, look at the bright side: it’s only a matter of time before Facebook changes its design again. Altova has been a developer-focused market leader in XML tools for many years; if you want to get a sense of recent mainstream XML market trends, tracking Altova’s product updates is a good bet. Check this page for the latest MissionKit features. It is always a very exciting time of the year here at Altova when we reveal our latest major software version, and I am pleased to announce our MissionKit 2012 release today! As always, we've packed a ton of exciting new features into this release and they span the entire product line. The researchers found that the number of Facebook friends that students had correlated with the size of the gray matter in several areas of the brain. One of the areas, the amygdala, is associated with memory and emotional responses. An earlier study found that this area was larger in people who had many real-world friends. Now it has been found that that's also true for those with lots of online friends, Rees said. In addition, three other areas of the brain -- the right superior temporal sulcus, the left middle temporal gyrus and the right entorhinal cortex -- were also larger among those with lots of Facebook friends, but the size of these areas did not correlate with the number of real-world friends, the researchers noted. Forbes’ Victoria Barret has written a wonderful insider piece about Dropbox that you can read here. She describes an early meeting between Dropbox founder Drew Houston and Apple‘s Steve Jobs. Steve was right. Houston’s job — along with his partner Arash Ferdowski — is to prove Steve Jobs wrong, but it won’t be easy and few have succeeded. Check the link below for some speculation. Also check the comment/discussion dynamic differences between the Google+ version and the Facebook version of the same post (e.g., the former is far more extensive, at the time of this post). Did you see all the news on http://techmeme.com/ ? The new phones and new Android OS are finally making me reconsider my Apple fanboyishness. Will Tim Cook answer with a sweeping new strategy? Some things Apple/Tim Cook could put in play? Matias is somewhat of an anomaly in our industry. He led major user interface projects at Danger, Helio, and most notably Palm — where he gave birth to webOS — which were incredibly inventive in both design and functionality. At those companies, he took the lead on the creation, design, and implementation of novel and new mobile interfaces. But he’s not just a skilled designer. Matias can talk about his designs in a way that people understand. Not only understand, but get excited about. He’s effusive, brilliant, and very focused. Unfortunately his work at those companies couldn’t find a foothold, and he seemed destined to toil away on doomed projects until he arrived at Google last year (he left Palm just after the company was acquired by HP) to work with his old boss from Danger, Andy Rubin. Groupon's foray onto public markets hasn't exactly been smooth, but sources are saying it's a go for next week after many rumours of the on-again-off-again variety. Those people familiar with the matter have been chatting to Reuters again, and are now saying that Groupon has a definite-ish start for its IPO roadshow: next Monday or Tuesday. Apple Inc. said China has become its largest market after the U.S. as the iPhone, iPad and iMac computer maker opened an online store last year and six retail outlets in the past three years in the Asian nation. China, the world’s most populous country, accounted for 16 percent of Apple’s fourth-quarter sales, or about $4.5 billion, Chief Executive Officer Tim Cook said on a conference call yesterday. Revenue in the nation was almost four times the year- earlier level, he said. Google Inc. today will unveil the first device running the new version of its Android software, stepping up competition with Apple Inc. and seeking to win over developers by making it easier to write programs that run on both phones and tablets. The latest Android incarnation will offer easier multitasking and a new way to access applications. With the update, Google Chief Executive Officer Larry Page aims to boost mobile-advertising sales and give customers an alternative to Apple’s iOS software, which runs iPhones and iPads. At stake is dominance in the $207 billion mobile-phone market, where iPhone is the top-selling device and Android is the most-used software. Still, Apple executives continued to ratchet up expectations for the current quarter that ends in late December. In an interview, Apple's chief financial officer, Peter Oppenheimer, described early sales of the iPhone 4S as "blow-away," and said "we enter the holiday quarter with tremendous momentum." The company, which is known for issuing low guidance, said it expects fiscal first-quarter earnings of about $9.30 a share on revenue of about $37 billion, higher than some analysts had predicted. The Time Warner studio paid an unspecified seven-figure sum for the rights to The Imitation Game, by first-time screenwriter Graham Moore. Moore's screenplay is an adoption of Alan Turing: The Enigma, a biography of the pioneering computer scientist, mathematician and wartime codebreaker by Andrew Hodges. Next year marks the 100th anniversary of Alan Turing's birth, with numerous events organised to celebrate Turing's life. Apple has updated its "how to buy" page for the iPhone 4S to note that Apple retail stores in the United States and Canada are now selling the device on a reservation-only basis. Customers will need to visit Apple's site after 9:00 PM each evening to reserve a phone for the following day. “”The threat to Facebook is that power users have gone to Twitter or Google+,” Parker told the Web 2.0 Summit — because, he says, Facebook isn’t giving them enough ways to manage a glut of information. But administration officials and even some military officers balked, fearing that it might set a precedent for other nations, in particular Russia or China, to carry out such offensives of their own, and questioning whether the attack could be mounted on such short notice. They were also unable to resolve whether the president had the power to proceed with such an attack without informing Congress. In the end, Libya’s air-defense network was dangerous but not exceptionally robust. American surveillance identified its locations, and it was degraded through conventional attacks. All of this raises an obvious question: How did so many Wall Street firms desperate to underwrite the Groupon I.P.O. miss these warning signs when pitching such a sky-high valuation? Or did they just turn a blind eye? To state this as clearly as possible: The four American companies that have come to define 21st-century information technology and entertainment are on the verge of war. Over the next two years, Amazon, Apple, Facebook, and Google will increasingly collide in the markets for mobile phones and tablets, mobile apps, social networking, and more. This competition will be intense. Each of the four has shown competitive excellence, strategic genius, and superb execution that have left the rest of the world in the dust. “We are conducting the world’s greatest experiment in real time on our children,’’ said Liz Perle, editor in chief at Common Sense Media, a San Francisco nonprofit group that helps parents manage media and technology. According to The National newspaper, Lt Gen Dahi Khalfan Tamim, the chief of Dubai Police, and Brig Gen Hussein Al Harethi, the director of the Abu Dhabi Police traffic department, both linked the drop to the service disruption experienced by BlackBerry users. Siri on the iPhone 4S still feels like a work in progress. I think it could have used another few months of development before it was released to push it well beyond gimmick territory. But Apple was already later than usual in its product cycle with this iPhone 4S, so might have been compelled to release it early. Even so, Siri as it stands now gives us a hint at what’s to come, and the future looks bright. After months of misery underlined by the declining market share of its BlackBerry phone in North America, a profoundly unsuccessful move into tablet computers and, just last week, a prolonged failure of its service for millions of users worldwide, Research in Motion has a new opportunity to convince the world that it remains relevant. The current Jaguar supercomputer there will become known as Titan as it is boosted from 2- to 20-petaflop performance – that’s 20 million billion mathematical operations per second. An exaflop is 1,000 petaflops and the US wants to achieve this 50x improvement on Titan by around 2019. China, the European Union, India, Japan and Russia are also targetting Exascale computing. If you look at the initial traffic figures, as presented by Chitika, the dramatic drop in traffic following the initial search might well make you wonder whether people were not finding sufficient to keep them involved. The image presented shows the data as determined by Chitika Insights: those interested can check out the methodology used. During the first few weeks, everyone at the company was working until two or three in the morning to get the books packed, addressed and shipped. Mr. Bezos had neglected to order packing tables, so people ended up on their knees on the concrete floor to package the books. He later recalled in a speech that, after hours of doing this, he commented to one of the employees that they had to get knee pads. The employee, Nicholas Lovejoy, "looked at me like I was a Martian," Mr. Bezos said. Mr. Lovejoy suggested the obvious: Buy some tables. "I thought that was the most brilliant idea I had ever heard in my life," he said. A snapshot suggesting Buzz had at least a few loyal users – perhaps Google would have received more user feedback, if they hadn’t disabled comments on the post. Why did thousands of people in Boston and across the country stand in line at dawn yesterday to buy the newest smartphone from Apple Inc.? Why not just wait a few days, until the crowds ebb? I asked the new iPhone 4S, the latest version of Apple’s best-selling device, which was released yesterday. The phone didn’t know. But it did know last week’s lottery numbers, next week’s weather report, and the capital city of the Asian nation of Uzbekistan. I simply spoke to the phone, and it displayed the correct answers in seconds. That might explain why so many people stood in line for the newest version of the iPhone. Its most vaunted new feature, the voice command system called Siri, responds to human speech with speed and precision. With the new iPhone’s faster processor, and its host of major software improvements, yesterday’s buying frenzy made a little more sense. LibreOffice, the project forked from OpenOffice.org, is moving into the modern era with developers working on versions that run in Web browsers and on iOS and Android devices. "These are not products available to end users, but advanced development projects which will become products sometimes in late 2012 or early 2013," the foundation said today. When you visit Blackberry community forums, the phrase “the final straw” pops up reliably in post made over the past few days and as much as IT managers like the Blackberry, the device is becoming unreliable at the one task it’s meant to perform. And the problem with the business of making fleet vehicles is that your end-users have no allegiance to your product whatsoever. Apple would have to anger tens of millions of iPhone users at the same time to threaten the product’s ongoing existence. For RIM to kill the Blackberry, they only need to anger thousands of administrators. And it’s possible that this week, they’ve done just that. Has Blackberry finally found its final straw - unreliability? This past quarter, Google generated $9.7 billion of total gross revenue. Of that, almost all of it was from advertising, both on Google’s sites and on its network “partner” sites, which run Google’s AdSense ads.